The introduction of zebra mussels (Dreissena spp.) to North America has resulted in dramatic changes to the complexity of benthic habitats. Changes in habitat complexity may have profound effects on predator-prey interactions in aquatic communities. Increased habitat complexity may affect prey and predator dynamics by reducing encounter rates and foraging success. Zebra mussels form thick contiguous colonies on both hard and soft substrates. While the colonization of substrata by zebra mussels has generally resulted in an increase in both the abundance and diversity of benthic invertebrate communities, it is not well known how these changes affect the foraging efficiencies of predators that prey on benthic invertebrates. We examined the effect of zebra mussels on the foraging success of four benthic predators with diverse prey-detection modalities that commonly forage in soft substrates: slimy sculpin (Cottus cognatus), brown bullhead ( Ameirus nebulosus), log perch (Percina caprodes), and crayfish (Orconectes propinquus). We conducted laboratory experiments to assess the impact of zebra mussels on the foraging success of predators using a variety of prey species. We also examined habitat use by each predator over different time periods. 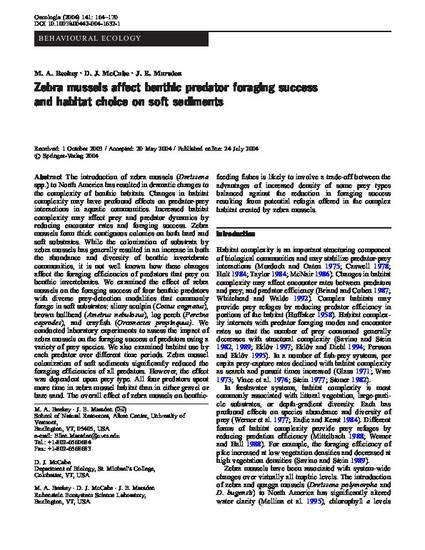 Zebra mussel colonization of soft sediments significantly reduced the foraging efficiencies of all predators. However, the effect was dependent upon prey type. All four predators spent more time in zebra mussel habitat than in either gravel or bare sand. The overall effect of zebra mussels on benthic-feeding fishes is likely to involve a trade-off between the advantages of increased density of some prey types balanced against the reduction in foraging success resulting from potential refugia offered in the complex habitat created by zebra mussels.